In my last post I left of this story just before lunch, when I didn’t want to wake up after our mini adventure. 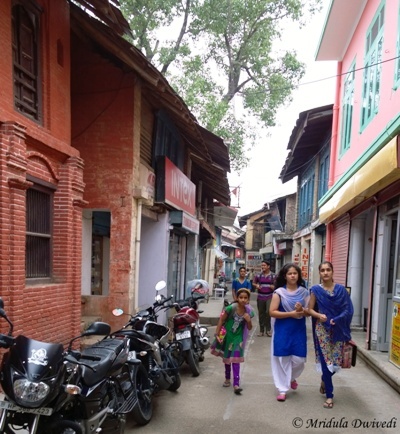 Pragpur is a delightful little town where the pace of life seems to be slow, where there is not too much traffic and where the weather had turned better by afternoon. I also felt a little less tired after a hearty lunch. 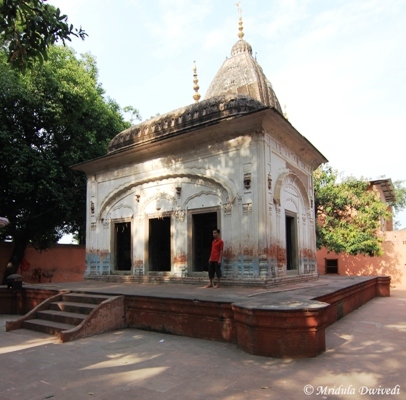 Our first stop was the ancient temple at Chanaur which is about 4 km away from Pragpur. It is said to be standing there from the time of Pandavas. 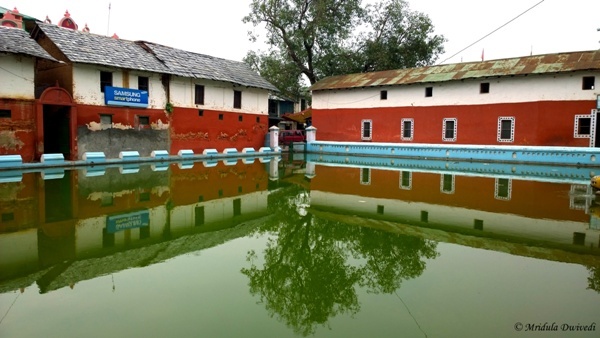 It is known for its langar (free food) but when we visit the langar was not operational. 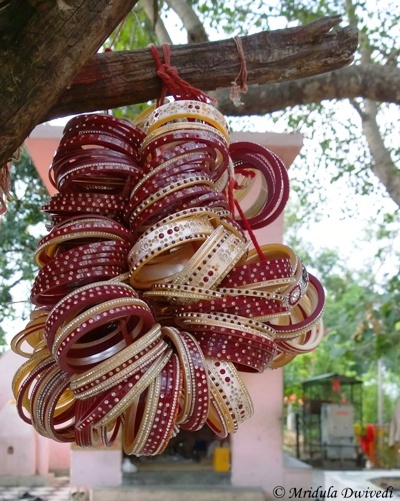 I was fascinated by the churas (bangles that newly wed women may wear in India) hanging from the trees. The story is that it has to be taken out within a particular time frame after the wedding and then some people put it in the temple. Close to the temple is a rahat (water mill) but due to lack of water it was not operational. We had a good time removing our shoes and dipping our feet in deliciously cold water near the rahat. It was a pain to put back my shoes and socks on the wet and muddy feet. But I am quite willing to do it again when ever I get the opportunity next. In spite of being such an ardent fan of Himachal Pradesh I had not heard of Kangra style paintings before this trip. But then I am someone who can really get puzzled by art. I can often not draw a straight line using a scale! At Dada Siba (which is close to Chanaur) there is an ancient (may I add nondescript from outside) temple also called Dada Siba. 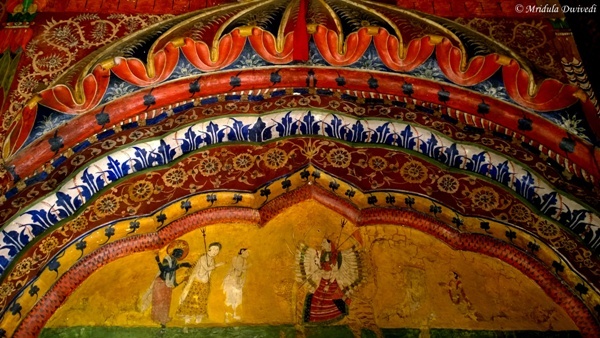 It has elaborate murals of Kangpra style paintings on its wall which are quite exquisite. The temple from the outside gave me no idea that the walls would contain such beautiful murals. The caretaker can also be seen in the picture. He said that the upkeep of this temple is now with the central government. It was late in the evening by now. 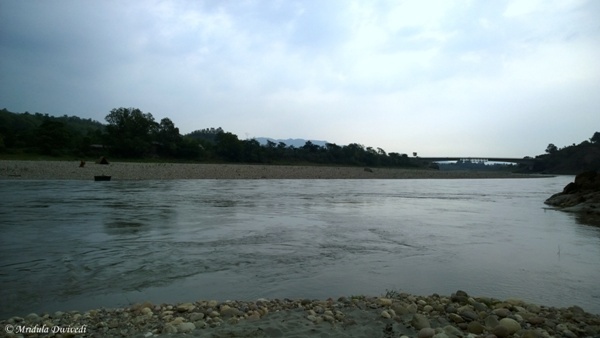 We stopped at the bank of river Beas at a place called Chamba Pattan which is about 5 km from Judge’s Court, Pragpur. The good folks had transported all the stuff to make chai and pakoras there. They had put some chairs as well but we decided to sit on the stones by the river. It was when I was sitting there looking at this peaceful scene with chai and pakoras that I truly woke up and felt refreshed. 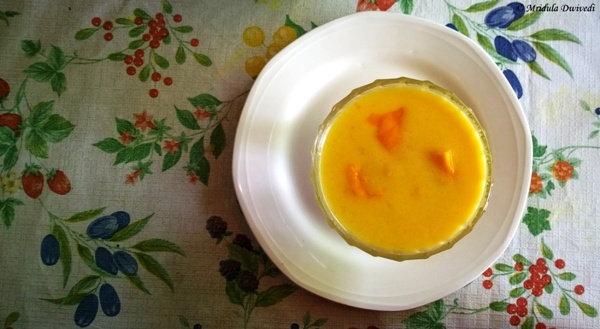 Before coming to Chamba Pattan we had stopped by the village of Garli but that is a story for another post. Right next to the Judge’s Court is a weaver’s home where we went in for a short duration. 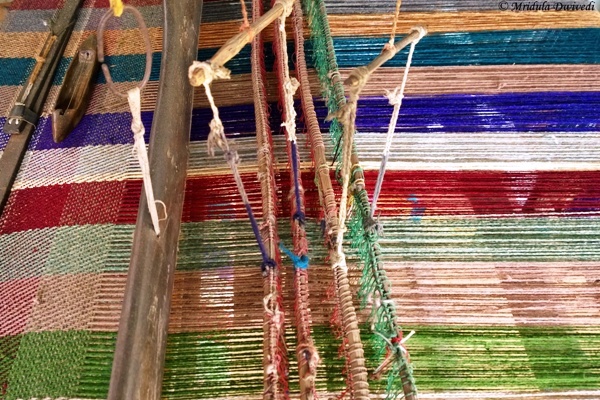 The house was almost empty but I saw this half finished weaving on the loom. The next day after breakfast we took a stroll around the Pragpur market. 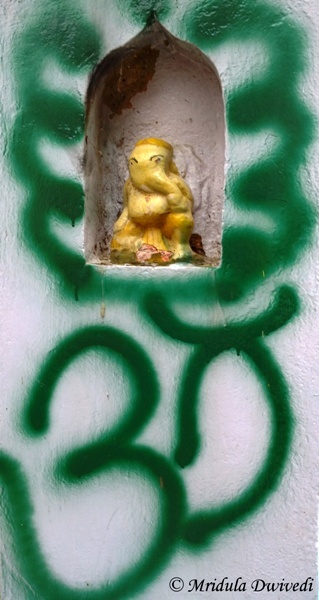 I spotted Lord Ganesh near the temple by the water tank. What caught my eye actually was the OM with spray paint! I mean why not use spray paint to decorate the wall! We walked through a narrow lane from the Judge’s Court to the water tank. If you keep walking around it you would reach the small market place. I wonder how do they manage to keep the color scheme of the buildings symmetrical. These lanes are so narrow that a car can’t be driven through many of them! That made walking quite easy. It was a pity that I did not buy anything from the market, there just wasn’t enough time. Pooja picked up a momo maker from one of the shops! Now looking at the market I didn’t expect that they would be selling momo makers as well! I entered this shop looking at earrings, which I didn’t buy in the end. 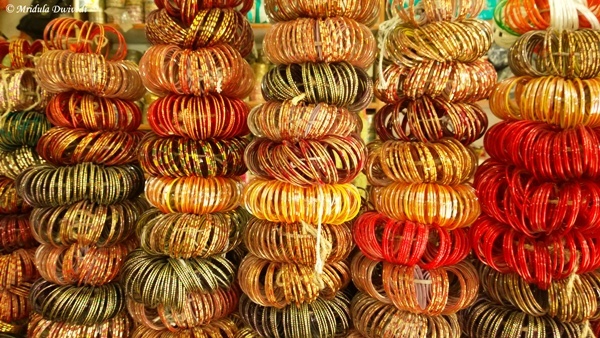 I asked the shopkeeper if I could photograph his bangle display. He nodded yes and then asked, “kya karenge aap iss photo ka?” (What will you do with the photo?) I told him I would post it on the net and he was content with my reply! Pragpur was a short but nice trip for me. In such a brief time I could probably not even start scratching the surface. But such is life, when did I say no to a trip even if all I could manage was to stay one night! I like visiting places which are not overrun by tourists. Pragpur in Himachal Pradesh falls under that category as of now. I was visiting the Judge’s Court and this was a one night trip. Reaching there was a mini adventure in itself, it should not have been though. But when two women and one clueless driver are out on the roads, unscheduled adventures are bound to happen. After commuting for 64 kms every working day, I feel quite tried as the week eventually nudges towards Friday. However on that eventful Friday I was leaving for Pragpur at night by a taxi. On invited trips I just turn up and take things from there, no route finding or any other botheration for me. We headed out a little after 11.00 pm and I was quite jittery about how would I fare on the trip. I get so tired these days! One thing that I didn’t bargain for was getting lost. I slept a deep sleep from 12 midnight to 2 am. We were approaching Ambala when I woke up. Pooja and the taxi driver had a discussion and I decided that all was well. When we were about 75 km away from Shimla I was not so sure anymore. We were not supposed to be anywhere near Shimla. It was time to stop pretending that I could sleep through it all. At the toll booth of HP, I decided to get out and have a chat at the person behind the booth. We should have crossed a place called Una and I was quite sure that Shimla was not the correct way to approach it. To reach Pragpur one has to detour on the Dharamshala road. I know one can reach Dhramshala via Shimla but an internet search showed it to be more than 250 plus km. I am not fond of getting lost for so many kilometers! I now have a fancy phone, a 41 megapixel Lumia1020 with HEREmaps on it. The trouble is I never used the navigation on my phone so I didn’t know how to switch it on when we needed it badly. When we turned back from that point towards Shimla I was desperate to reach Pragpur because my tired body wanted to pie down horizontally on a bed. I switched on the navigation from where ever we were and set it to Pragpur. It was some 167 km away. My phone battery lasted till Una. But by then it was 7.00 am and everyone knew where Pragpur was. We finally reached Pragpur at 9.00 am. The Judge’s Court was such a welcome sight. After a heay breakfast I decided to crash till lunch. When Pooja woke me up at 1.00 pm I was still so disoriented that I opened the door and crashed on the bed once again! That is how the trip to Pragpur started! When I saw the litchi fruits on the tree at the Welcomeheritage Judge’s Court, Pragpur it so reminded me of my childhood home. Of course, our home was not set in 12 acres nor was it double storied but that too had mango and litchi trees among other fruits. 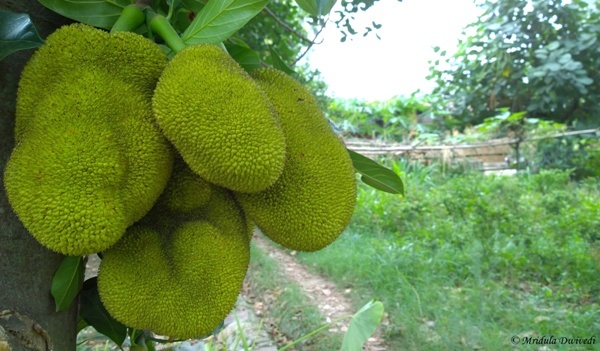 All my childhood and college days I could pluck fruits from the trees and eat them. It was almost after a decade and a half later that I picked up a few litches from the tree and ate them at Judges Court, Pragpur! Some parts of this manor are 300 year old. You can read more about its history here. The Judge’s Court is a WelcomeHeritage hotel, an ideal destination where you go to do nothing. There are many ways in which you could achieve that. 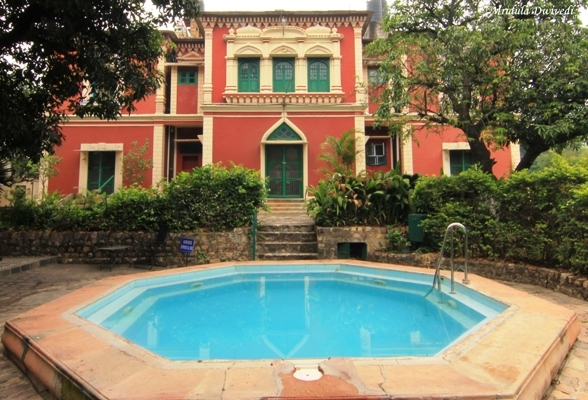 You could sit in the lawns and enjoy the silence, lie down in your well appointed room and do nothing, go for an aimless walk, doze off on the second floor veranda (my favorite corner in the entire place) , take a dip in the pool and in many more such ways. That would be the best way to spend the holiday there. I had a one night stay at the Judge’s Court, Pragpur and it was my fault. I had to come back in a hurry and I hardly ever say no to a trip when I am invited! 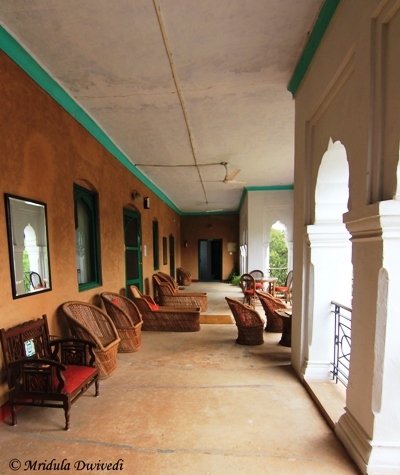 Even in that short stay I would run off to this huge veranda on the second floor and sit in the easy chair. I thought I would read a book but I just daydreamed lying down and looking at the open courtyard below! 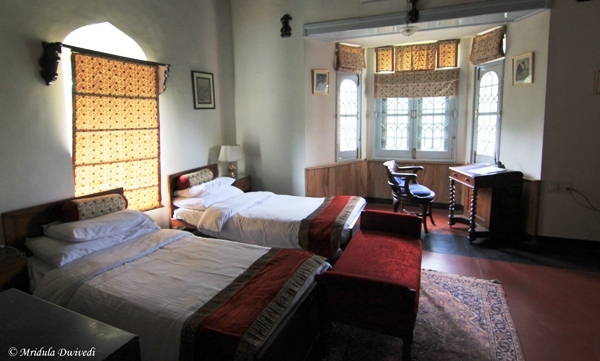 Judge’s Court has 20 rooms in all 10 in the main building, 7 in the new wing and 3 heritage rooms in the Pragpur village. They give you a feel of the bygone era. I had a comfortable room with twin beds all to myself. The bathroom was modern and functional with a shower. The hotel grows a lot of its own supplies like fruits, vegetables and has a dairy farm too. The food hence tastes fresh and good. I had both Indian and continental food and enjoyed both equally. The mango crush of course was quite delightful. The whole place is full of interesting curious and if you are a person who really likes them, you could spend days looking at each individual item. There was an old hamam that caught my eye as well, the mirrors on the wall reminded me of a time when people may actually had time to observe themselves in one! But what I enjoyed most was the trees at the country manor. There were clove, almond, camphor, plums and many more such exotic trees. The feeling of space and peace that I got there is unmatched. How I wish, I had some more time to stay. And this is just about the property, wait till I talk about the nearby places. 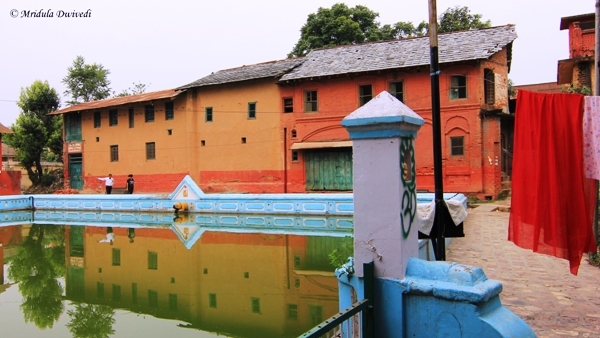 Also, even though Pragpur is a heritage village, it is not touristy at all, at least for the time being. PS. I was invited by the property to spend some time with them.